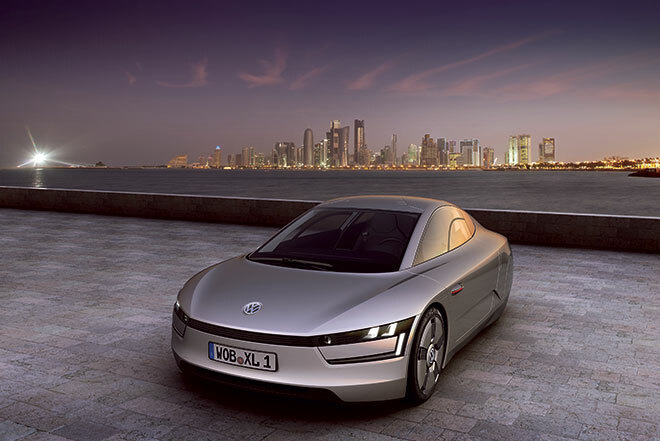 Volkswagen today presented the XL1 prototype, the eagerly-awaited vehicle that consumes only 0.9 l/100km (261.3 US mpg - 313 IMP mpg)! Scheduled to make its world debut at the Qatar Motor Show (26-29 January), the new concept releases only 24 grams of CO2 per kilometer, obviously thanks to a series of technological innovations, all of them supposed to cut emissions and improve mileage. The XL1 uses a combination of lightweight construction, monocoque and add-on parts made of carbon fiber, a very low aerodynamic drag (0.186) plus a very advanced plug-in hybrid system which relies on a two-cylinder TDI engine and an electric motor. Specifically, the car measures 3,888 mm / 1,665 mm / 1,156 mm (153 in / 65.5 in / 45.5 in) and has a wheelbase of 2,224 mm (87.5 in). The 800 cm3 two-cylinder TDI engine generates a maximum power of 48 hp and 120 Nm of torque, while the electric motor adds an extra 27 hp and 100 Nm of torque. The powertrains are mated to a 7-speed DSG, with the electric unit being backed by a lithium-ion battery pack. Weighing only 795 kilos, the car can sprint from 0 to 100 km/h in just 11.9 seconds, while achieving a maximum electronically-limited speed of 160 km/h (99.4 mph). The estimated range of the electric motor is 35 kilometers, while the whole autonomy, TDI plus electric, goes up to 550 km with only 10 liters of fuel.